Low back injuries are a common form of work injury. Surprisingly, they occur frequently at the office versus a job where lifting or heavy labor are involved. Here are five simple ways to reduce lower back pain at the office and what to do if you experience a work-related injury to your lower back. The lower back has a natural curve to it. However, with prolonged sitting and natural slouching, that curve can become less and less pronounced, causing the lower back to become more straight. This can cause discomfort and even significant pain while sitting. Ensure that your office chair has lumbar support or at the very least, put a small pillow behind the small of your back while you sit. You don’t want to stretch your arm or have to lean forward to use your computer mouse. Slide it back towards your body so you don’t have to overreach to operate your mouse. In order to reduce strain on your legs and lower back, your feet should be flat on the floor and about shoulder-width apart. Your lower body should be at 90-degree angles — a 90-degree angle at the knees and again at the lower back. Resist the temptation to cross your legs or tuck one leg up under you in the chair. Make sure you get up and walk around at least once an hour. Not only does this help to stretch out your muscles and prevent your lower back from getting cramped, it also increases blood flow to your legs and reduces the risk of blood clots, which are rare but can occur from prolonged sitting. If you spend a great deal of time on the phone for your job, ask your employer to get a headset for you. Cradling the phone between your head and shoulder can cause your neck to cramp up and make it more difficult for your entire spine — including your lower back — to stay in alignment. 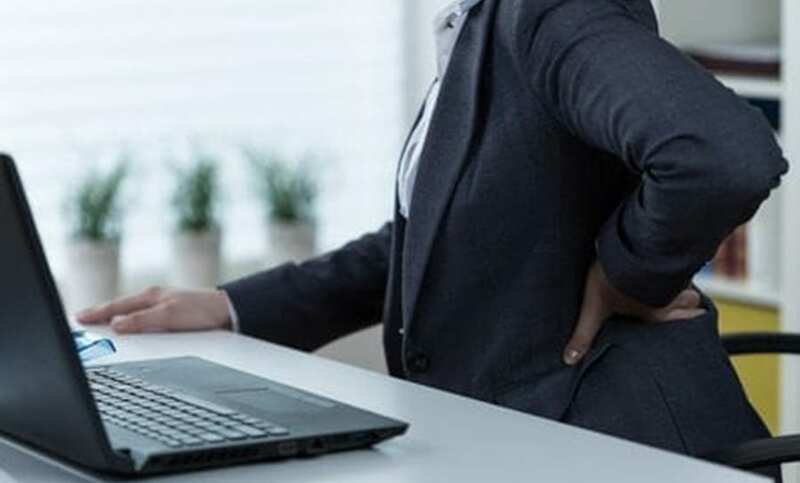 If you’re experiencing lower back pain at work, you may be entitled to benefits for medical care and lost wages if you’ve missed days due to pain. Contact us today by calling (985) 532-0555 for a consultation. We can help you determine if your lower back injury qualifies for workers’ compensation.